Scarlet Threads takes pride in presentation. The event will be set-up similar to a retail store. Please prepare your items in an “eye candy” sort of way! Hangers – PLASTIC ONLY white preferred but not required. Tagging Guns are not Required, but highly encouraged as they protect clothing the best. You can purchase one online under $10 (www.storesupply.com) or (www.bargainprice4U.com). Make sure and allow 2 weeks for delivery. Inspect all items for holes, tears, missing buttons, stains, fading, etc. If any are found in your merchandise, please remove those items from your inventory. Scarlet Threads will not accept these items. Make sure that you have at least 15 items to consign, this is the minimum requirement to consign at the Scarlet Threads sale. 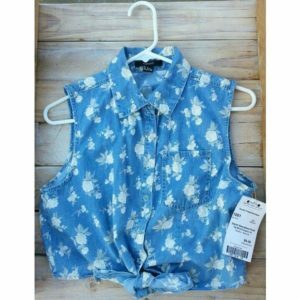 We now have a maximum of 250 items per consignor. Having a hard time letting go of some things? Ask yourself the following questions about those hard to let go items: Have I worn it the last 6 months to a year? Do I love it, would I wear it right now? Does it currently fit me? And does it fit with my current wardrobe, do I have something to wear it with? If you can’t answer yes to all of these questions for your particular item in question then consign it, pass it along for another lady to enjoy, and shop the sale for some new pieces! Make sure that each item is hung with the hanger hook pointing to the left, so when you are facing the item the hanger is making a question mark (?). If hanging a set please be sure to secure both items together with rubber bands or safety pins. Jeans, pants, and skirts will be required to be hung on separate pant hangers, the pant hangers will be provided at your drop off appointment and it is your responsibility to get them hung when you drop off. Scarves, belts, purses, and hats will be displayed on tables and hooks so they will not require hangers. 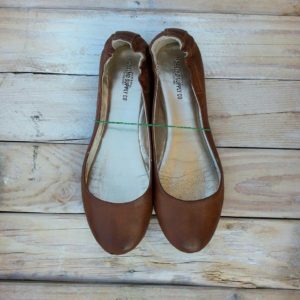 Shoes should be paired together with ribbon or a zip tie. Please make sure that there is enough slack so that customers can try them on (about 5 inches). Shoes boxes are discouraged. After hanging your clothing items you will need to enter and print tags for all of your items through our MySaleManager system. All items must be at least $3.00. 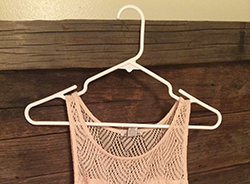 You may combine items on one hanger in order to price them at $3.00. After printing your tags you will need to attach them to the correct items. 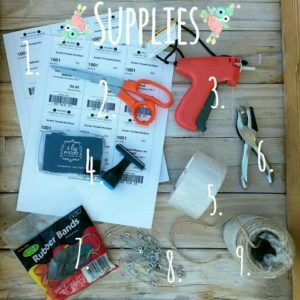 You can attach the tags by using a tagging gun (preferred) or safety pins. Straight pins and staples are NOT to be used. 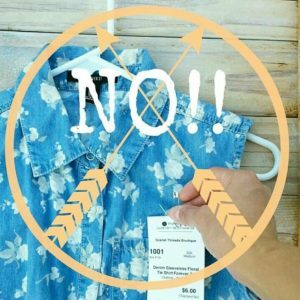 If you use a tagging gun please tag through the clothing label or if you would rather tag through the seam then tag through the right armpit seam or right side of waist seam for jeans/pants. If using safety pins, please pin tag to the clothing label. Pinning through the garment causes holes and damages the garment. Please attach a Yellow ribbon to the hanger of designer items. 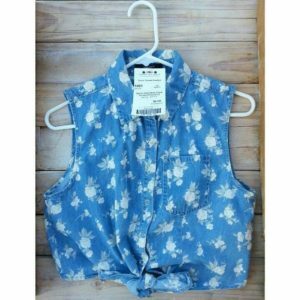 This make the item stand out to our shoppers, who may be unfamiliar of designer labels. 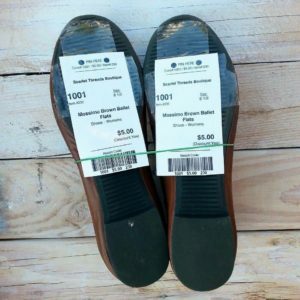 Shoes: Use clear packing tape to attach tag to bottom of shoe. Please DO NOT cover the bar code on the tag with tape. Another option is to attach the tag to the shoe with zip tie or ribbon. Purses: With the purse facing you, use a zip tie or ribbon to attach the tag to the right side handle of the purse. For clutches or wallets you can attach the tag with ribbon or a zip tie to the zipper of the item. 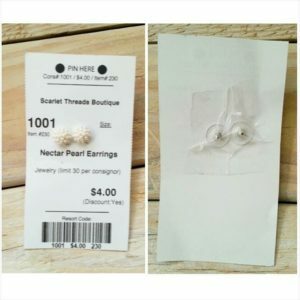 Accessories: Jewelry: Earrings can be attached to the tag itself and the back of the earrings should be taped on the back of the tag so that they do not fall off(back of earrings are required), for Necklaces the tag can be attached with a ribbon, for Rings you can use ribbon. Sunglasses, attach tag with a ribbon to the center nose bridge. Faux Designer Items: Faux designer items or replicas will be allowed at our event, but it is very important that you tag and price them accordingly! 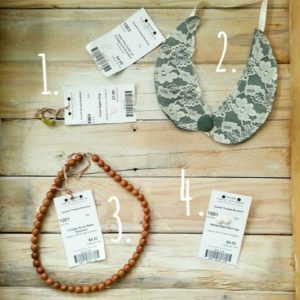 It is your responsibility to price and label these as a faux designer or replica items. If the consignor fails to do so they will NOT be able to consign at future sales. **When prepping home décor, please make sure the placement of safety pins and/or packaging tape will not ruin the item. If you have any prepping questions, please feel free to contact us. **Please make sure that all of your tags are securely attached to your items! If for some reason your tag falls off, we cannot sell your item because we won’t be able to credit the correct consignor. If the tag is missing and we cannot find your item in the system, then we cannot sell your item, which will be a loss for you and the customer. Please make sure that you schedule a drop off appointment (this can be done when you login to your consignor account). Arrive at least 5 minutes early to your drop off appointment. Bring a printout of your signed Consignor Agreement/Release Form. Sort your clothes by size and separate items that are $50+, make sure EVERY item has a tag attached and clothing is placed correctly on the hanger before you drop off your items. If you do not have your items sorted by size at drop off, you will be asked to step to the side and organize your items by size. 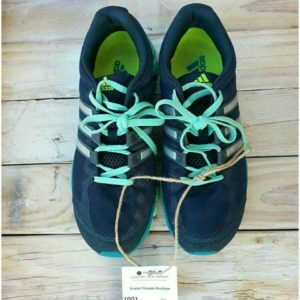 Our volunteers will check all of your items to make sure they are prepared correctly and that they match up with Scarlet Threads’ standards. If not prepared properly, you will be asked to step to the side and prepare your items in the correct manner. Please do not be offended if an item of yours is not accepted, we will be happy to explain why and give you an opportunity to remedy the problem if possible. After your items are all checked in, you will help our volunteers to place your items in the correct locations on our sales floor. Please pay attention to accuracy of placement because an item in the wrong area will have a lower chance of being sold. Don’t forget to get your pre-sale pass so that you can come and shop early! Pick up will be Monday, June 24th, 2pm-6pm. Pick up will be on a first come first serve basis. At pick up your unsold items will be sorted and ready for you. Please go through your items and let us know of any items that you think may be missing. This will be the ONLY time you will be able to look for any missing items. Any items that are NOT picked up before 6pm will be donated to our chosen charity as outlined in our consignor agreement, no exceptions will be made. Can’t make it? You can send a relative or friend to pick up your items in your place. Please note that in order for anyone to pick up unsold items they must have the name and consignor number to verify the account, NO exceptions will be made. If you chose to donate your unsold items then you are done. Sit back, relax and wait for your check to arrive in the mail! Consignor checks MUST be cashed within 90 days of date printed on check. Checks will only be reissued at the sale owners’ discretion and will include a reissue fee. Any un-cashed checks will be turned over to the state of California after 90 days and will be out of Scarlet Thread’s control. We will NOT re-issue checks after 90 days.